Struggling hockey players and those who suffer from bad luck never seem to miss an opportunity to miss an opportunity, but Mackenzie Blackwood doesn’t appear to be one of them. 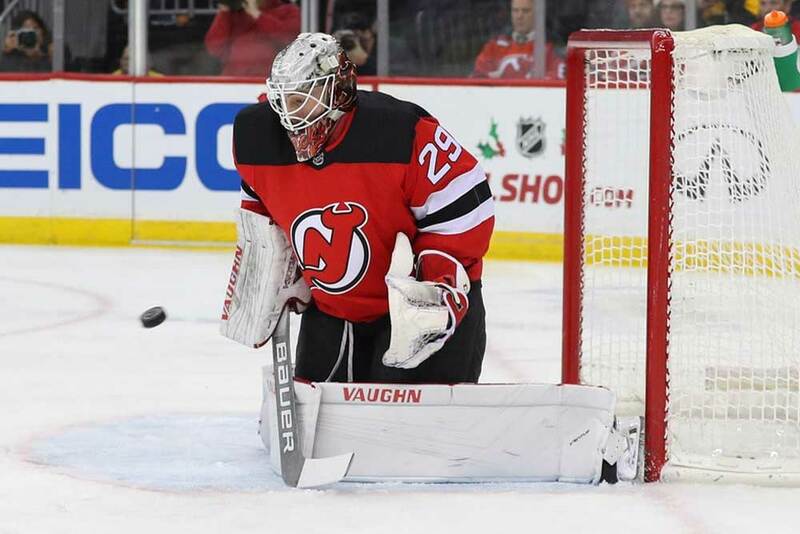 The 22-year-old netminder is making the most of his chance with the New Jersey Devils and making a solid case to stay in the NHL. The native of Thunder Bay, Ontario recently posted his second consecutive shutout when he blanked the Vancouver Canucks 4-0 on New Year’s Eve. He didn’t allow a goal in a 2-0 triumph over the Carolina Hurricanes two days earlier and finished the calendar year by being named the league’s Third Star of the Week. I suppose Devils’ fans shouldn’t get carried away at this stage since Blackwood could eventually turn out to be a flash in the pan. But since being called up by New Jersey from the American Hockey League’s Binghamton Devils’ he’s gone 3-1 with a goals-against average of 1.25 and a save percentage of 96.3 in seven appearances. Blackwood is now the youngest goalie in New Jersey franchise history to post two straight shutouts in the regular season as he bettered the mark set by Hall of Famer Martin Brodeur in 1995. In addition, he’s the first NHL rookie to register two straight clean sheets since John Gibson of the Anaheim Ducks achieved the feat on the last day of 2015 and the first Devils’ rookie to do it. Blackwood has the size to excel in the world’s best hockey league since he stands 6-feet-4-inches tall and and is quick and athletic for a big man. The Devils obviously saw something in the youngster when they drafted him 42nd overall in 2015 from the Barrie Colts of the Ontario Hockey League as the top-ranked goalie in North America. The chance to grab the bull by the horns has presented itself since Cory Schneider has had to battle injuries lately and Keith Kinkaid has faltered slightly as the Devils’ number one goalie. Blackwood also stood out in the only NHL game he’s lost so far as he made 37 saves in a 2-1 defeat at the hands of the Columbus Blue Jackets earlier in December. Blackwood was called up by New Jersey just eight days before Christmas and head coach John Hynes feels he may be ready to compete for the number one job despite his age. Blackwood himself may be a bit surprised at his early NHL numbers especially after going 7-17-6 with Binghamton last season and posting a 3.41 GAA and an 88.2 save percentage. However, he credits the Devils’ blue liners in front of him for his early success. Blackwood’s confidence is growing with each passing contest in the NHL and he feels he can compete at the top level as long as he continues to focus on every aspect of the game and remains on an even keel. He said he wants take things just one day at a time and doesn’t want to get too high on himself after a wain and too low following a loss. Of course, those may be hockey cliche’s but they seem to be working well for the young man right now. Blackwood enjoyed a fine junior career with Barrie and was named to the OHL’s First All-Rookie Team in 2013/14. He inked a three-year, entry-level deal with New Jersey six months after the club drafted him in 2015 and appeared in 68 career AHL and five ECHL games before being called up by New Jersey. His first NHL appearance came a day later when he started the third period in a 7-2 home loss to the Toronto Maple Leafs after Kinkaid was pulled. Blackwood allowed two goals on eight shots and started the next game, a loss against Columbus, but then reeled off three straight wins. Things haven’t always gone his way though as Blackwood played for Canada at the World Junior Hockey Championships in 2016 and went 0-2 in three games with an 85.9 save percentage and a 3.93 GAA. This was a bit of a shock to his system since he was named to the OHL’s First All-Star Team that season and was also the league’s goalie of the year. His brief demotion to the ECHL last season also seemed to make him aware that he needed to pull up his socks if he intended on making it to the NHL. The Devils sure hope he’s the real deal since Kinkaid and Schneider have been far too inconsistent over the past year. Schneider hasn’t won an NHL game in over 12 months when he’s been healthy enough to play and has gone 0-15-3 over that span with an 85.2 save percentage this season. Kinkaid’s stats have been below the NHL goaltending average in 2018/19, but Blackwood’s presence between the posts could be the wake up call he needs. New Jersey is going to have to play well above .500 hockey for the remainder of the season if they hope to reach the playoffs and it’s possible Blackwood will be the catalyst for a team turnaround. He’s either going to have to carry the team on his shoulders the rest of the way or spark an upswing in Kinkaid’s game. It’s a possibility, but the Devils may have waited a bit too long to call Blackwood up.